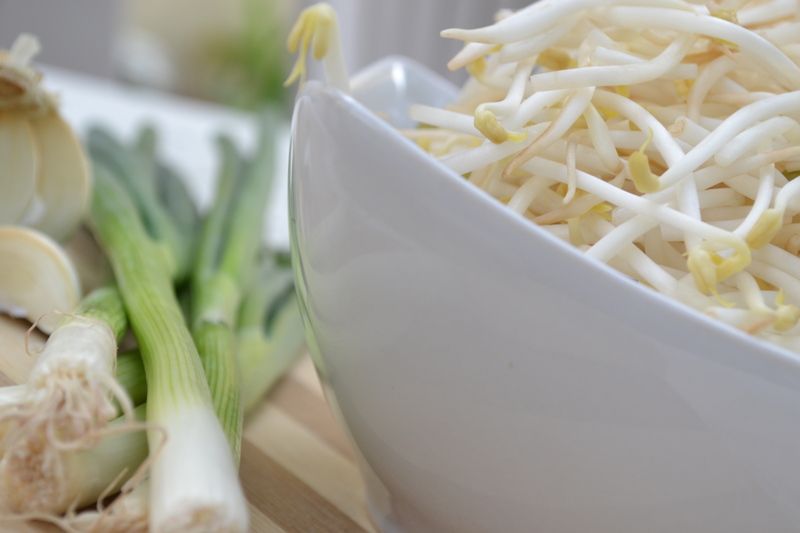 Summer is here and with the mercury soaring high the last thing cooking in my kitchen is a heavy meal.My mantra for summer is “Light and Easy”.This recipe for stir fried bean sprouts is the perfect solution to a healthy and delicious meal. 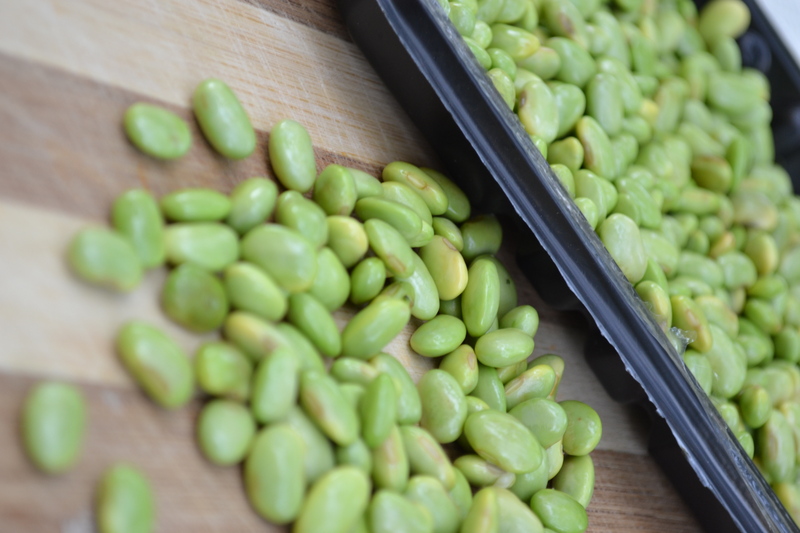 I was looking at adding something exciting to Bean sprouts.Bingo…thats when I spotted this lovely tray of bright green and fresh Edamame. 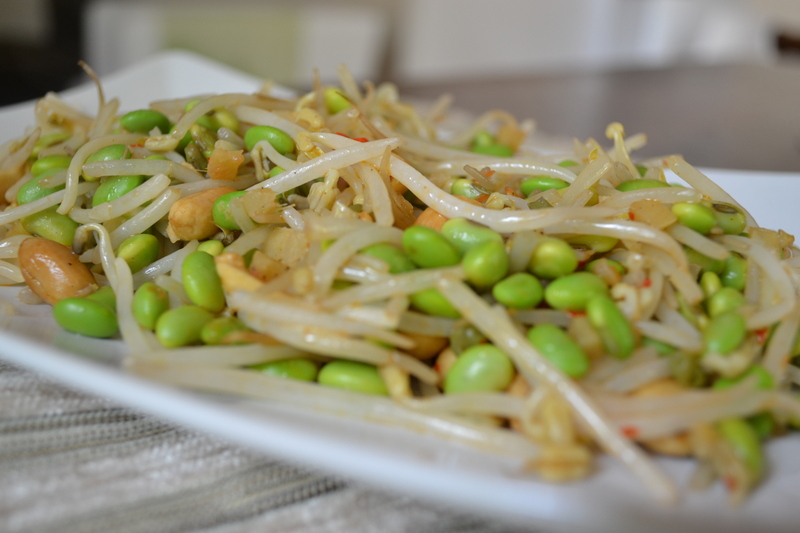 Mmmm…Stir fried Bean sprouts and some eye-catching Edamame was my lunch today.Edamame commonly know as soybean are great just steamed and salted.A great snack while watching those calories. Well today they are going in with some bean sprouts,green onions,ginger and garlic to give me a perfectly delicious meal and all in less than a couple of minutes. I hope you enjoy cooking this stir fry.I had these beans with some Chicken in black bean sauce and along with some jasmine rice. 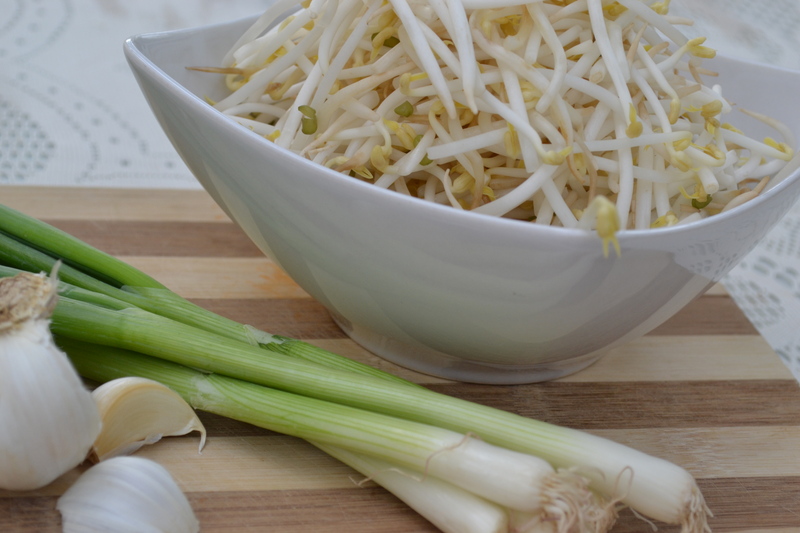 Blanch the bean sprouts in hot water for about a minute. Steam the edamame beans till tender. 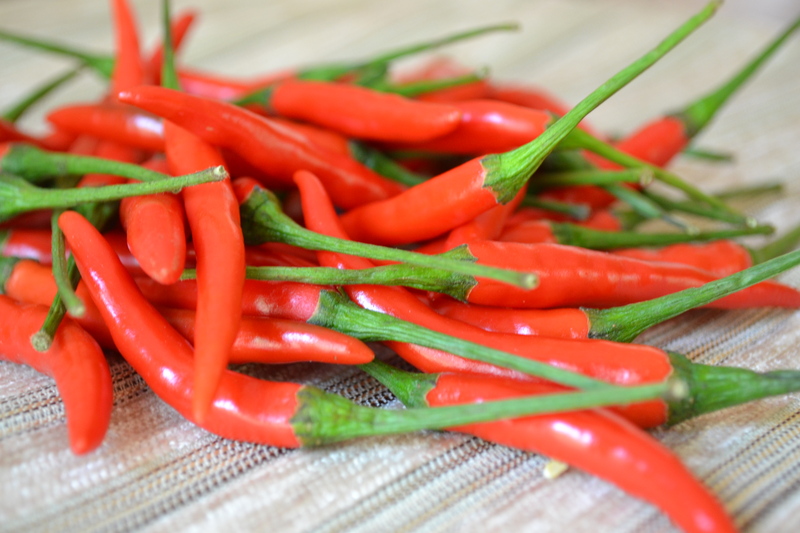 Heat a wok till its smoking hot. 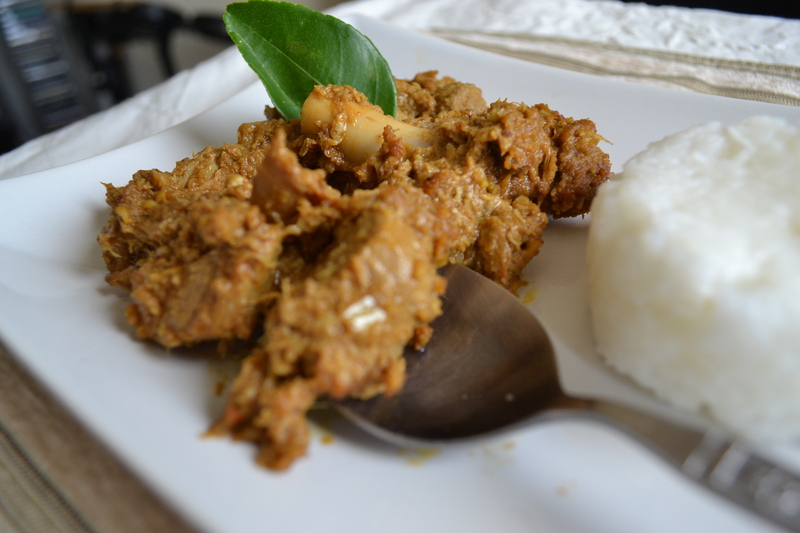 Drizzle with some sesame oil. Add the ginger,garlic and chopped red chillies and stir fry for a minute. 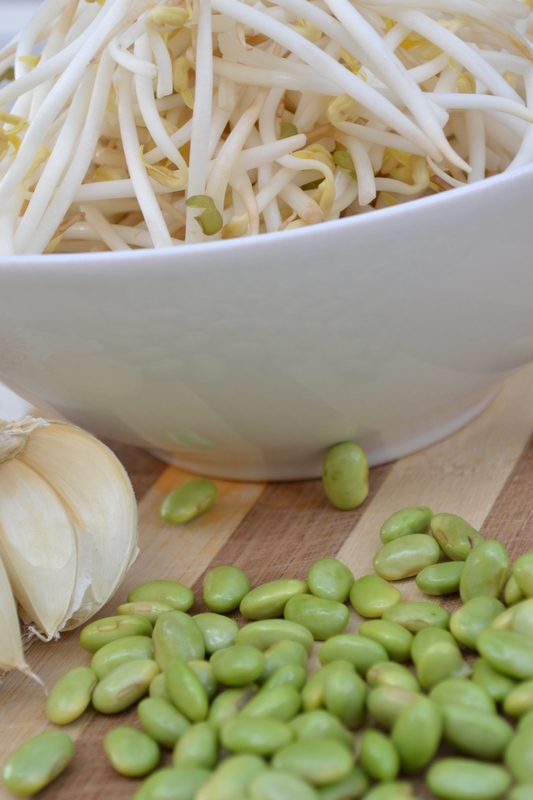 Add the bean sprouts and edamame beans. Mix the soya sauce and the chilli oil paste and gently stir into the beans. 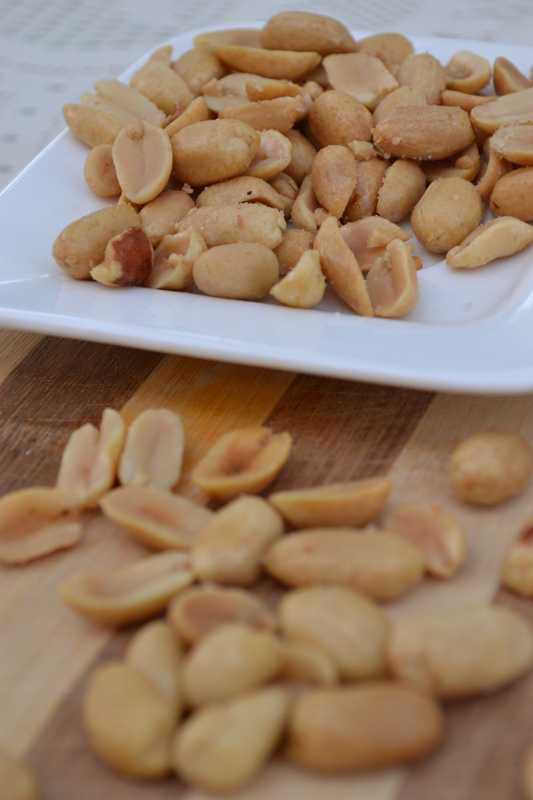 Lastly add some and the crushed peanuts. 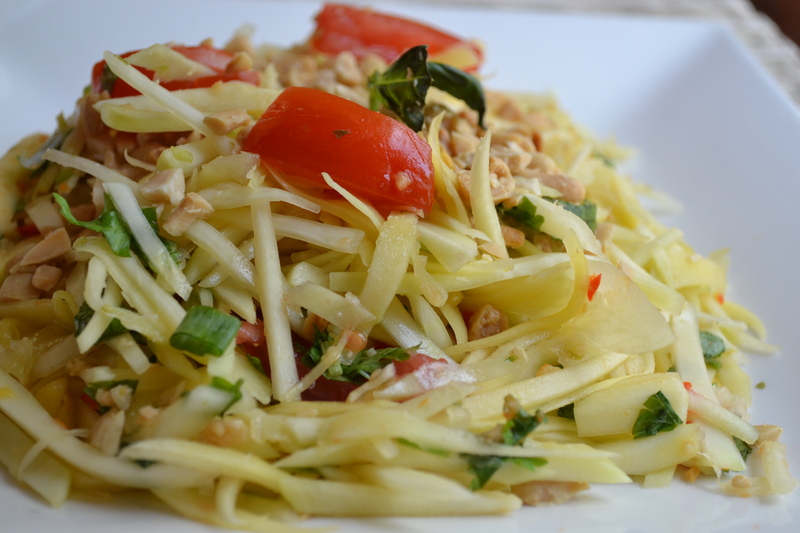 Som Tam or more popularly know as the Thai green papaya salad is the perfect accompaniment with any Thai meal.Now while one is spoiled for choice with amazing Thai joints here in Dubai,I absolutely love putting together a simple thai meal at home. 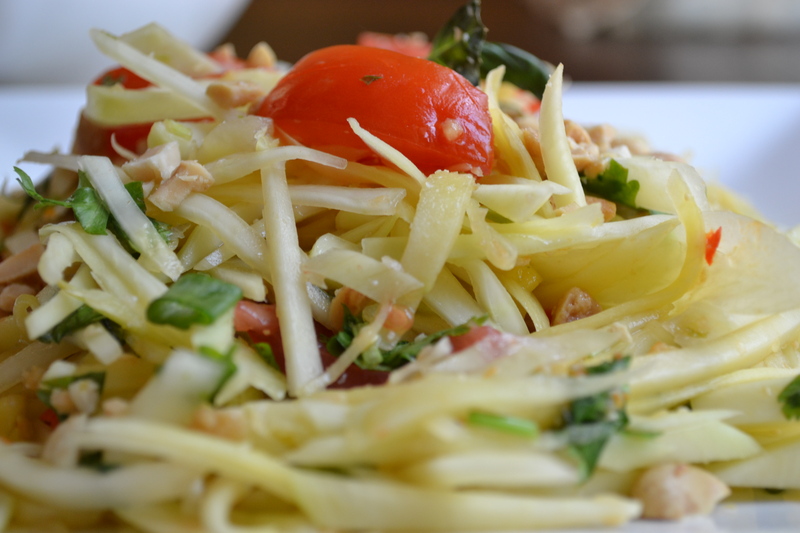 Last weekend we were having a pot luck dinner.I decided to make a Thai green curry with sticky Jasmine rice and this wonderful Green papaya salad.I for one am a big fan of this salad. 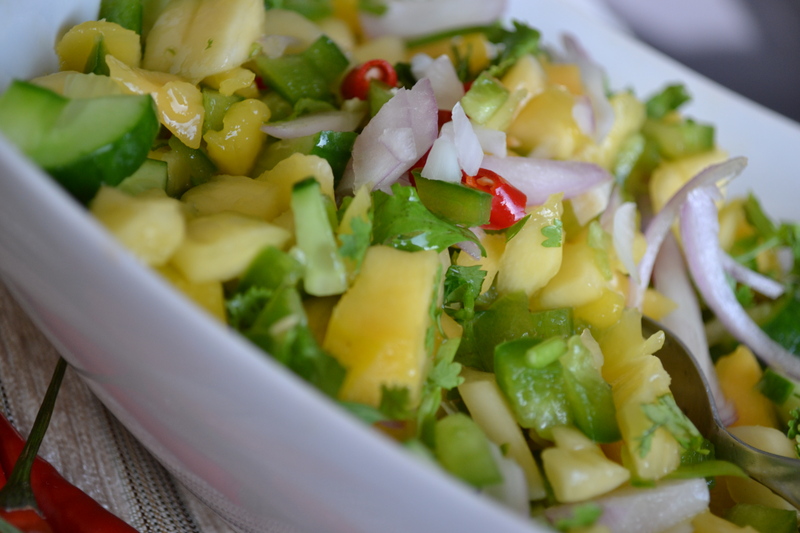 Do select a green and un ripe papaya for this salad.You do want the flesh to be firm and white as possible. Grating the papaya is the easy way out.however I like to use a slightly different technique as I like a nice bite to this salad. Use a peeler and remove the outer green skin.Slice a thin layer off the inner white flesh.Have a couple of such layers ready.Now place all these layers on top of each other.Cut them in fine slivers-more at an angle. 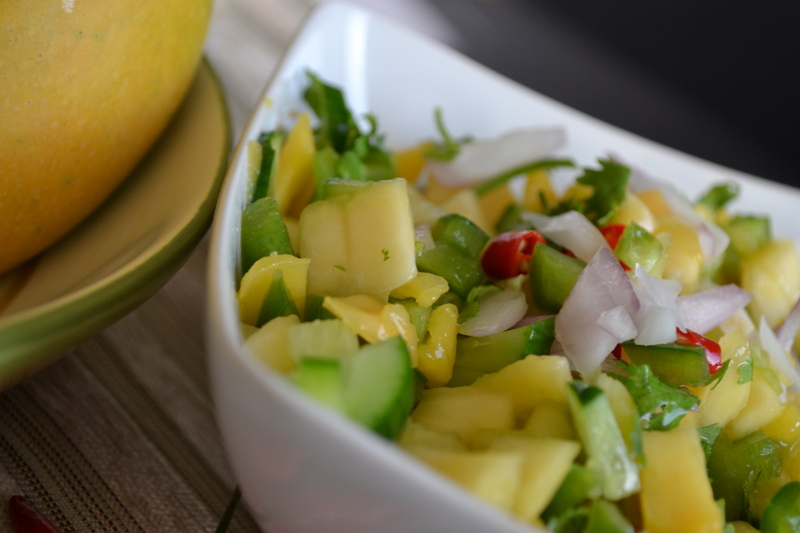 I just love the sweet and spicy flavours in this salad.The sweet mainly from palm sugar.I’ve just used regular sugar.The spice is by grinding the thai red chillies and garlic.Traditionally a mortar and pestle would be used to do this.I’ve just whizzed it in a small food processor. 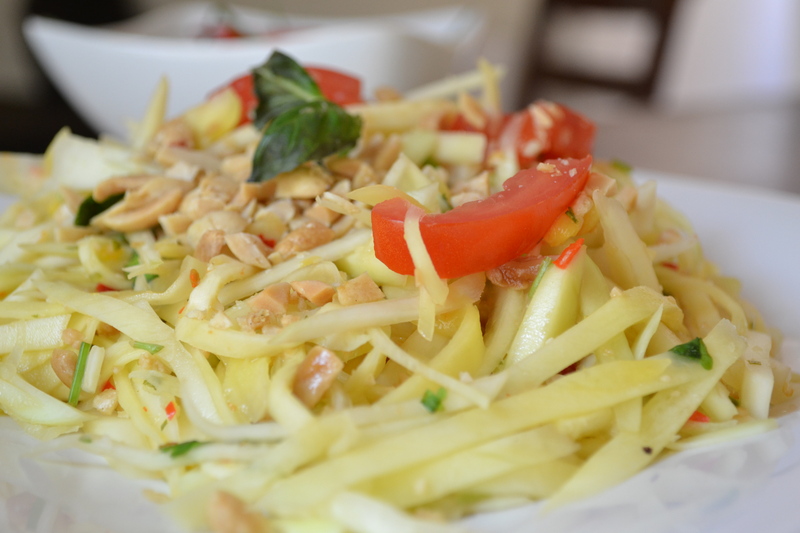 I’ve gone ahead and added a grated green mango to this papaya salad…Just makes it more tangier.Some other variations could be grated cucumber or even bean sprouts. We had some left over salad the next day and my husband decided to throw in some peeled segments of orange.Gave a whole new dimension to this salad I must say. 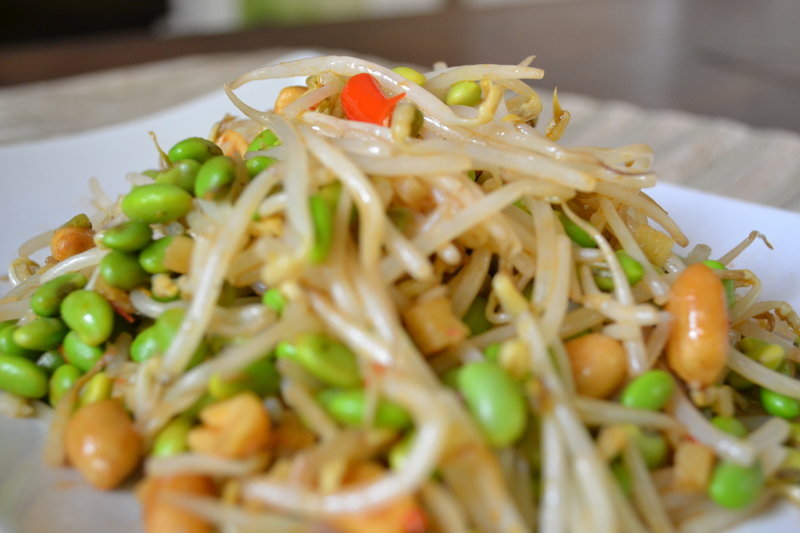 I do hope you like this salad.Do give it a try.My pot luck dinner went off well with fish cakes and spring rolls as appertizers.For the main course I had friends bring in the Pad thai noodles and some brocoli with tofu. 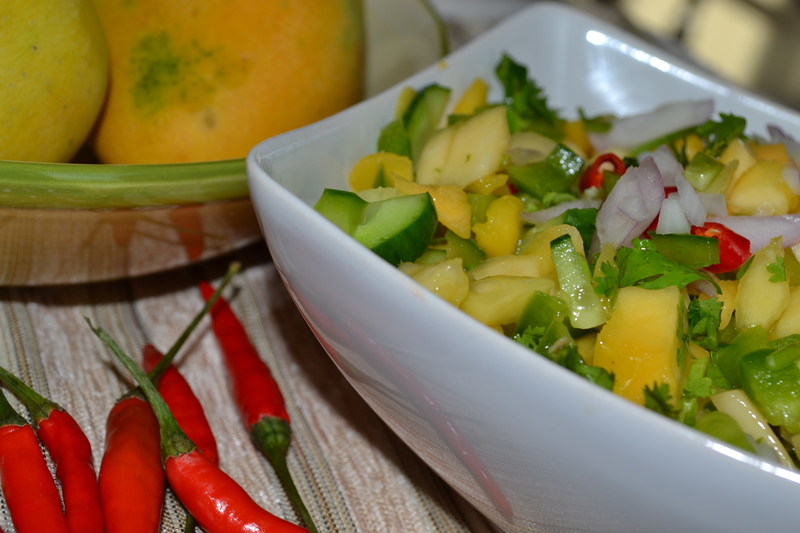 And of course Thai green curry with jasmine rice along with this delicious Green Papaya and mango salad. We had this wonderful Raspberry almond gateaux for dessert which another dear friend brought along…Have to add it here.. Cheers to Food,Family,Friends and laughter always. Chopped segments of mandarin oranges go really well as I discovered the following day. Peel the outer skin of the raw papaya and either grate it or use the technique mentioned above. 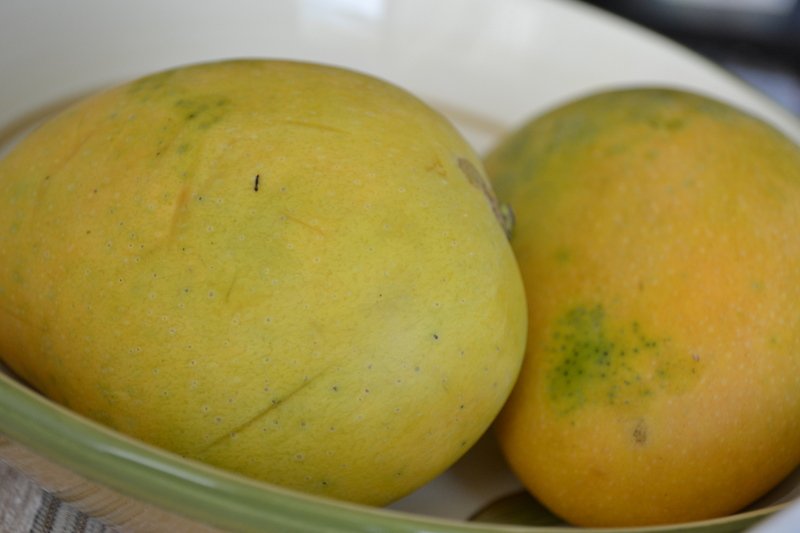 Grate the green mango and mix it with the papaya. 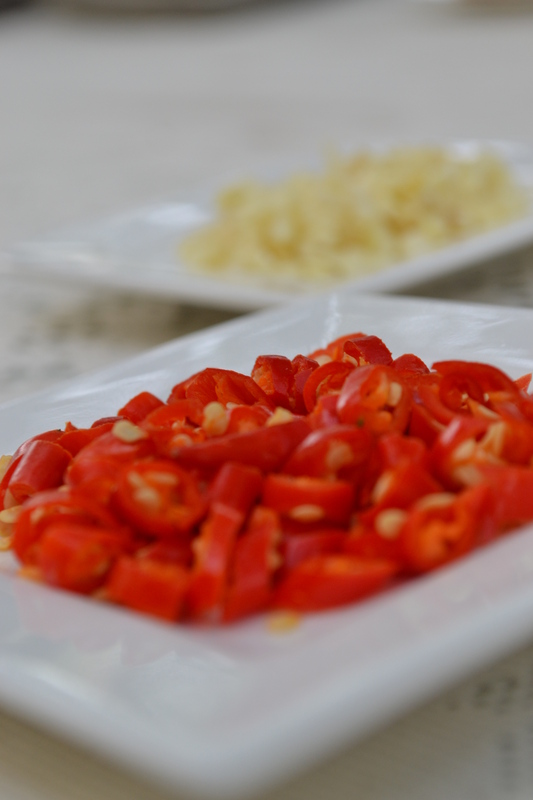 Use either a mortar and pestle or a small food processor to grind the garlic and the red chillies together. Now add the fish sauce and the lime juice to the above mix. 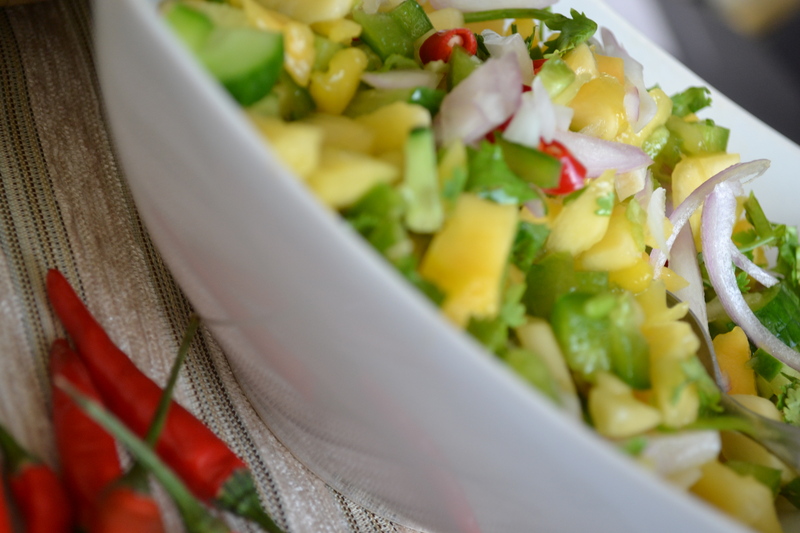 Add this dressing to the raw salad just before serving. Garnish with crushed peanuts,chopped tomatoes and basil.